analogy what was used to show where the plates are. this is one-half. other side of that girder has the other side. here's some pictures of that plate. you can see what we've been talking about for a long time. 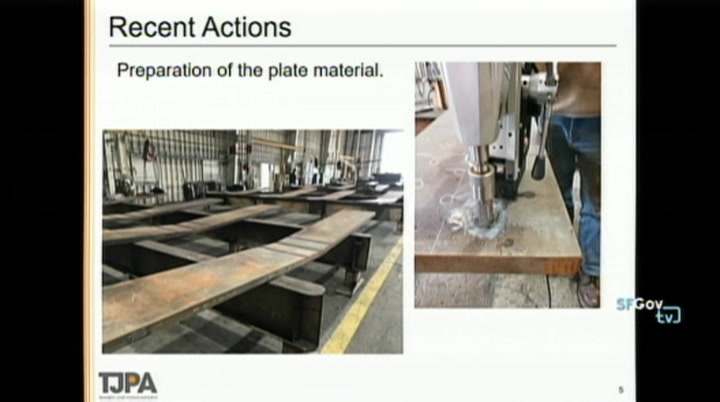 these are the plates that when they arrived in stockton, drilling some of the drills for this 370 steel. all the plates, the new plates were drilled in stockton. the existing plate on the two girders out there and first street, are getting drilled in place. they're bringing the plates after the new plates are drilled in and stockton and much more efficiently to do it. 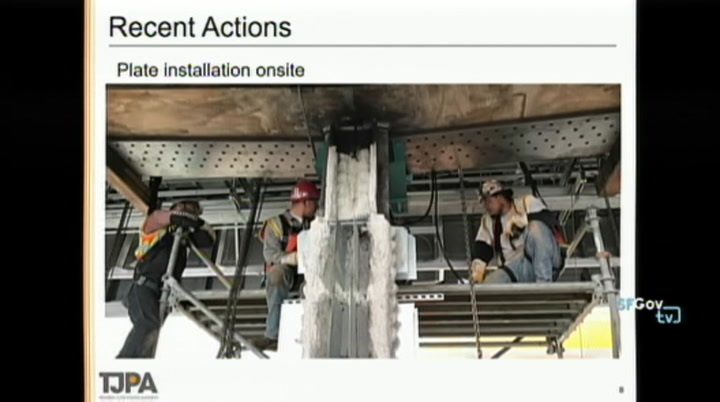 now they're putting up and drilling out the existing girders. you can see in this picture, this is the team fitting up the plates to term plate the existing and ongoing with that process in prepping even to the point where sandblasting is happening. wherever girders were done, they are cleaning it up. this is the nice, proper sir fass between al--surface betwee. what are the next steps? 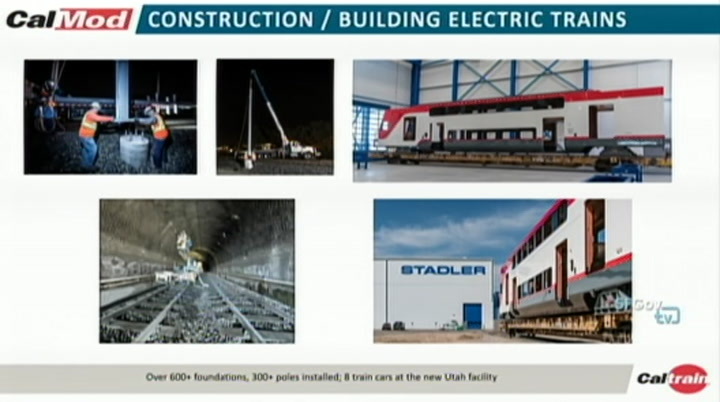 project team will continue to do that facility wise. 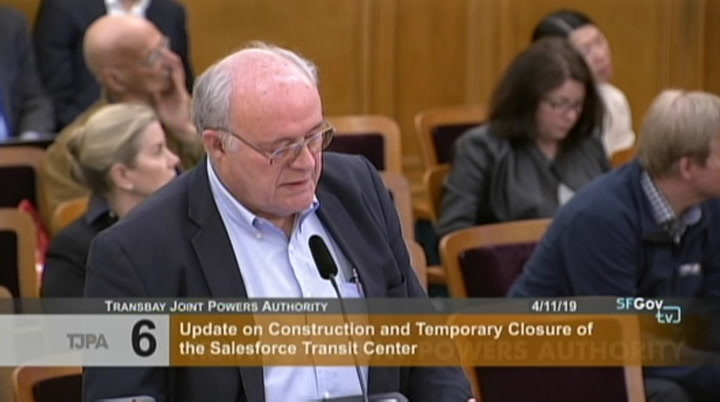 mark mentioned that by end of of this week that we would receive documents from one of our contractors. they confirmed that this morning. they are expecting that this week. we anticipate to digest that and at that time we'll be able to ascertain if we need to go with any elements in the field. ultimately we anticipate by end of this month, a full package delivery to the p.r. feed for their review. depending on how the review goes over the next couple of weeks. 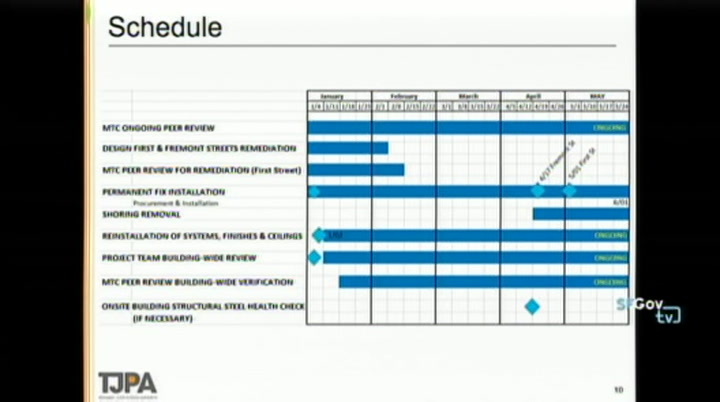 what's going to happen in may, we'll complete the repairs and remediations by may. we also will have the shore removal. i'll talk to that in a second. the reinstallation all facilities in close proximity of girtedders in both locations, which makely means -- basically means we'll stitch it back. all of that has to go back at street level that will be very soon. here's our schedule slide. 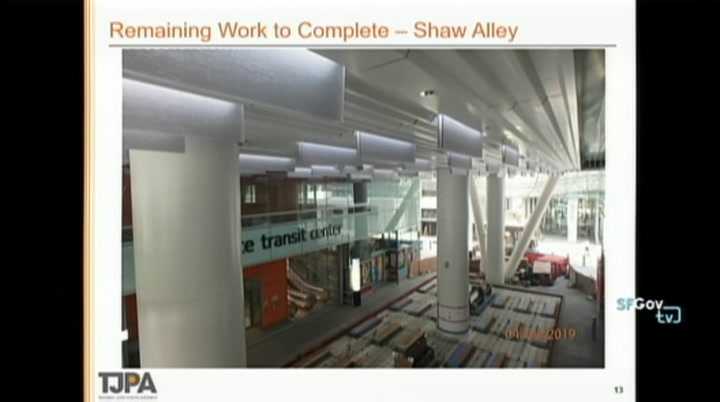 breezeway, far west end, there's still ceiling panels still require to install. there's quite bit of cell panels that's been majority of the subcontractor that's been out there and still out there performing contract work. shaw ally. that's what you're looking the ceiling light us and the ceiling is done looking down the concrete of the flooring. it's starting to be poured. there was a challenges with the electrical elements with the jaime carpenter artwork that was worked out. had work through a gfci. it's a device that's in all of our kitchens and bathrooms. ours is a lot bigger. they worked through that and those items are on back order. we'll get the concrete poured. as soon as those do show up, the lights and the benches and floor will be able to be activated. that's coming in due time. we're able to put the concrete in short order now. the traffic signals. 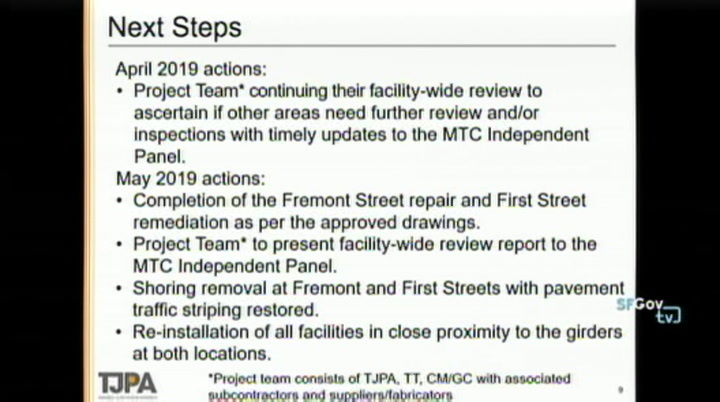 at first, fremont and beal, the contractor has done all his work. pg&e has parts on back order and cannot power our signals. 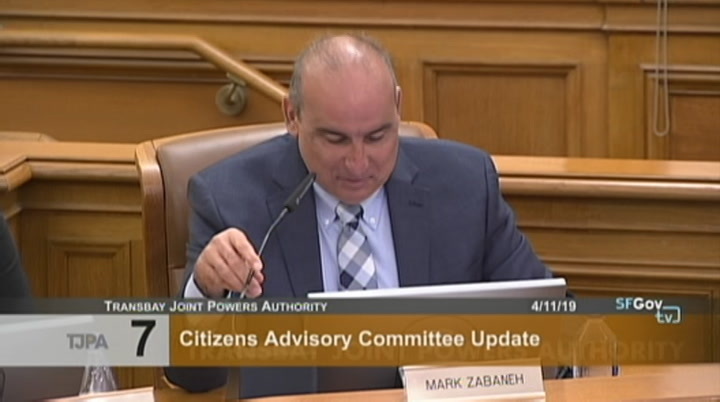 that's why if you haven't driven through there and uyou see all e signals dark, pg&e they anticipate they won't show up until mid-may. we want to get activated immediately. it affects local businesses. it affects sales force tower getting out their garage. 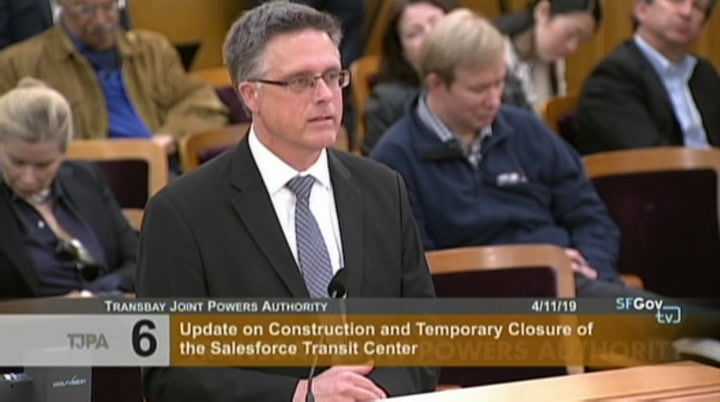 there's lot of elements why we've been waiting for a long time for pg&e to come through. 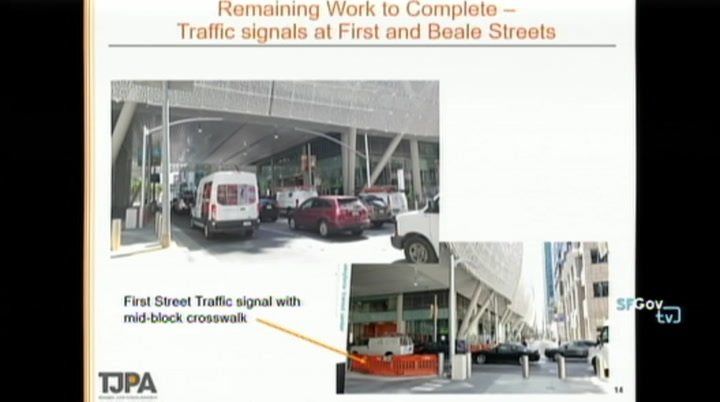 that's why what's happening at the three signals that are on the project. there's other ceiling panels throughout the building as well too. momentum with reaffirming the structural integrity of the building. 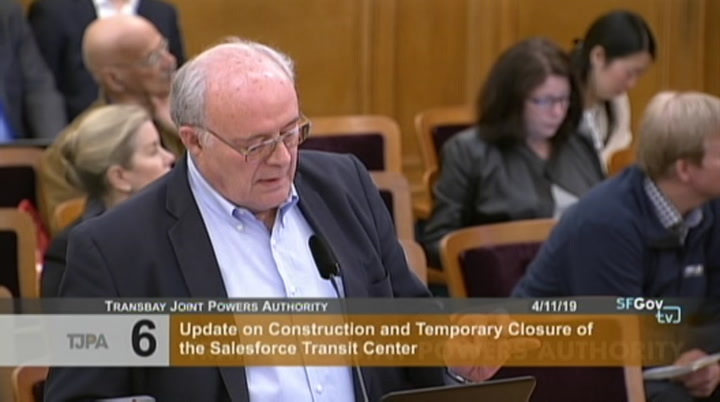 the repairs ought to be done by end of april and before june, only thing that will stand between us and opening is whether or not we've made our way through all those other concerns regarding brittle fracture. did momentum on that front. 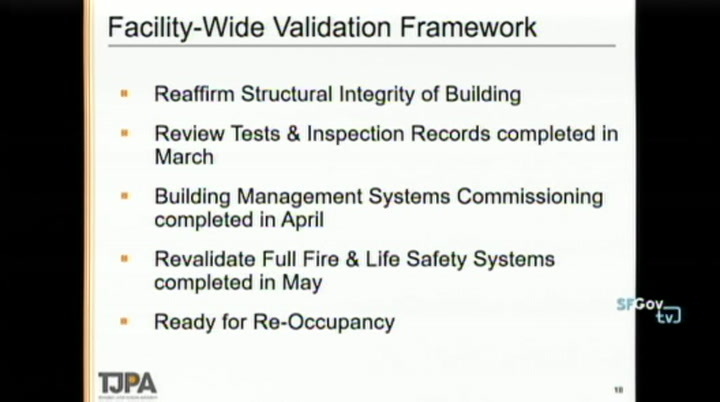 review of test and records were completed in march. the documents we spoke of earlier is the deeper dive on the fabrication and piece information, shot drawings from all the different fabricators. it was slow coming at first. 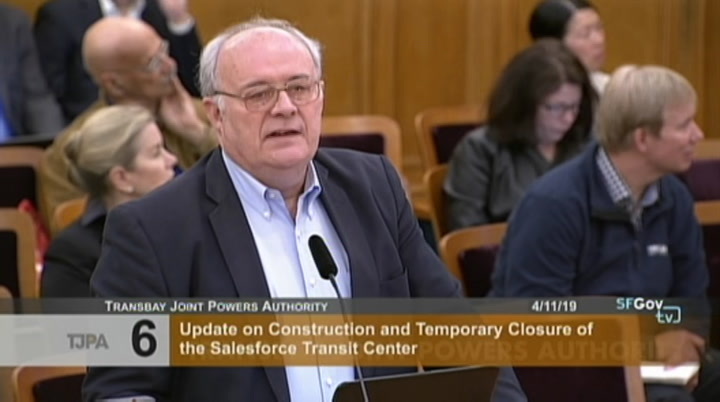 a wealth of documents came last week and as dennis mentioned, more of the fabrication and sequencing information is forthcoming. 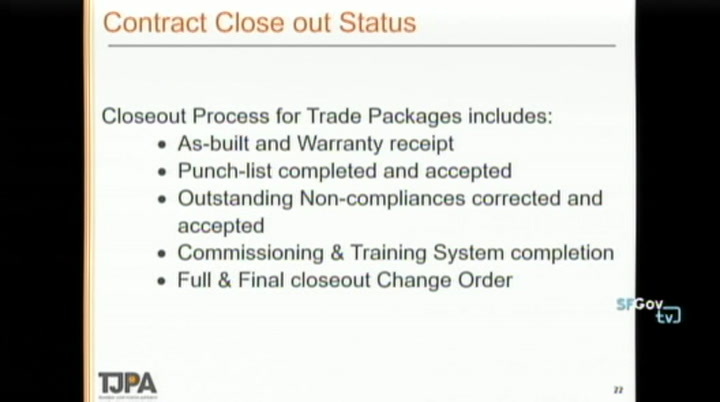 advancing 13 trade packages are expected or anticipated to be involved in the claims process. as we speak, 16 trade packages are ready for full and final closeout and awaiting those documents for my signature in the coming days or week. with three trade packages already closed, those were the very early site-related trade packages. with that i can take further questions or dennis can address more detail on the repair. >> chair nuru: any questions? no questions? minutes are approved. call item 9.2. 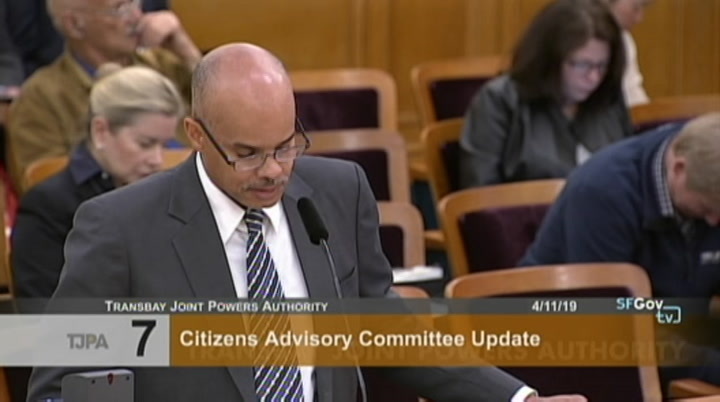 [agenda item read] we have not received indication from the public like to comment on it item. [roll call] item is approved. item 10. [agenda item read] >> this item presented by aaron. 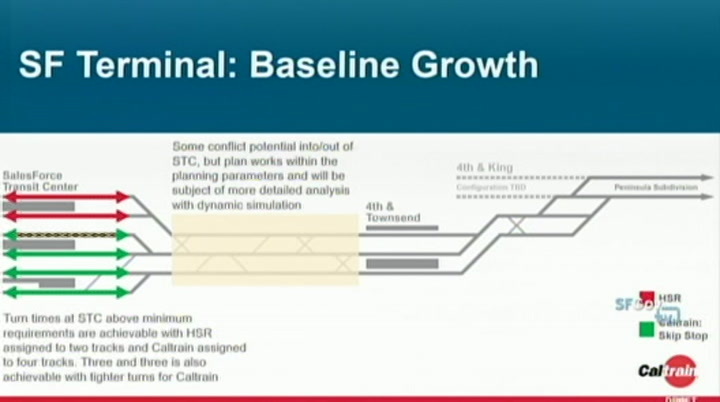 proportion between operating phase 1 and phase 2 with heavy leaning towards operations. there's the administrative expenses, day-to-day things that go on, insurance, office supplies, those sorts of things. 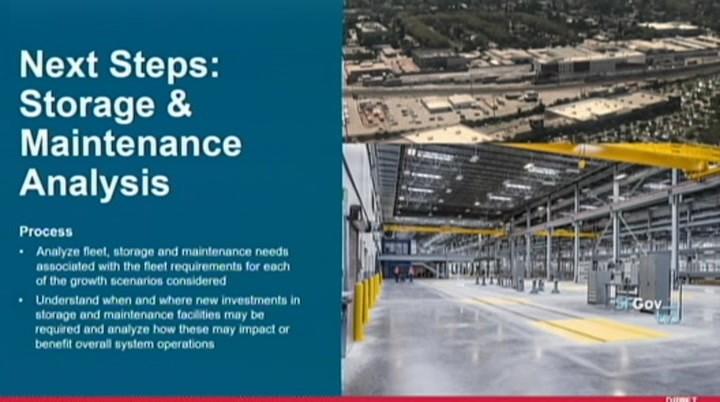 then there's the transit centre operation, which is the big chunk of the operation budget. there's professional services, mainly l.p.c. 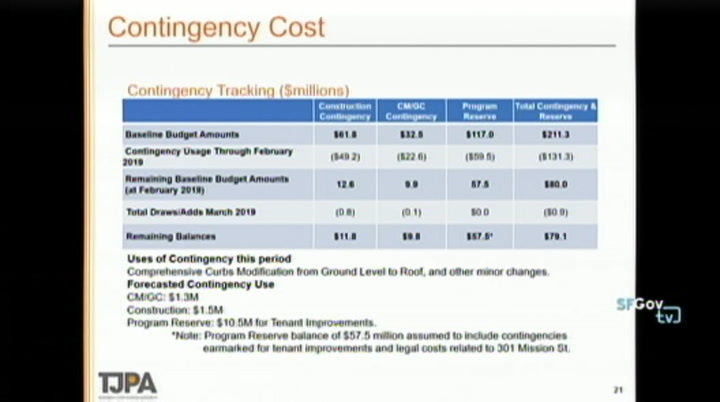 contract security, i.t., cybersecurity all included in the transit centre big chunk of the operating budget. 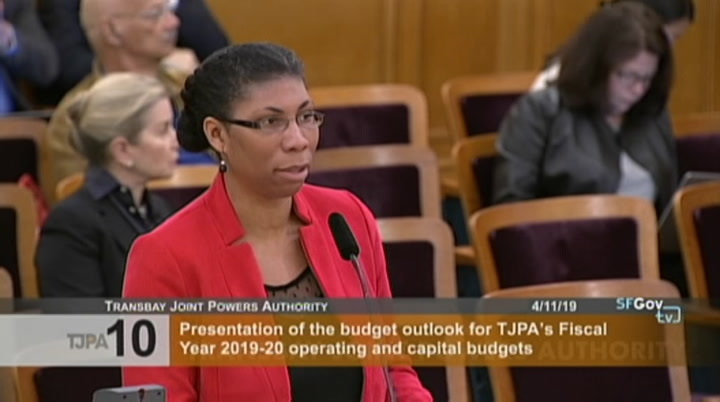 this year in 19-20 we'll have debt service and operating. 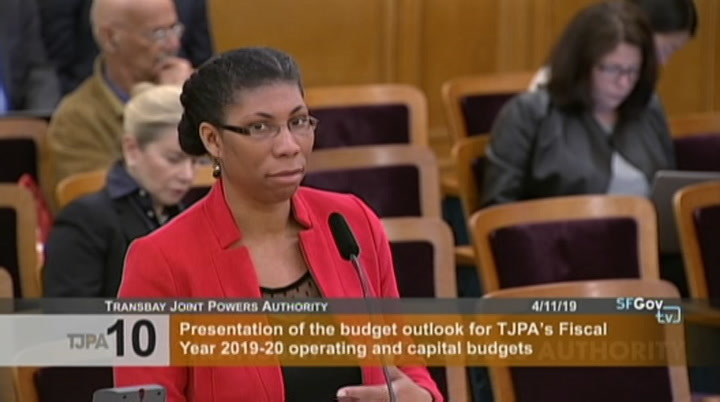 the debt service wasn't included in the preview that you had in your previous board meeting. trains. we're also doing lot work with the 21 local jurisdictions we run through on the corridor. looking at separations, community impacts and benefits. finally with stanford's help, we're undertaken organizational review which is looking at organization, service project delivery as well as governance. we're hoping to have this wrapped up by the end of calendar year. we're aiming to have the board make big picture decision on the corridor. somewhere in the summer of 2019. that big picture vision really is a vision for growth. casey mentioned, we are in the process of electrifying. 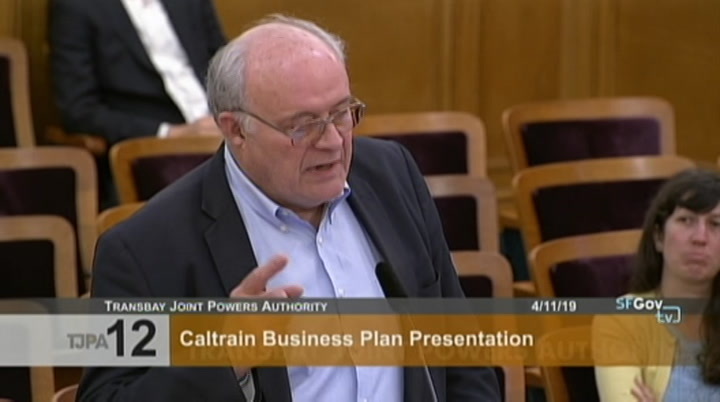 growth and change are already very much on the agenda for caltrain. we know there's a lot of change coming in the corridor. the question is really, how much change and how much growth and how will that growth manifest. 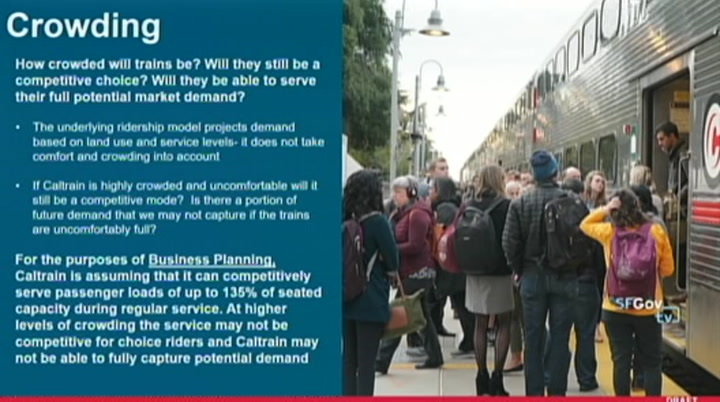 we're asking these questions in part, we see our trains are getting full today. 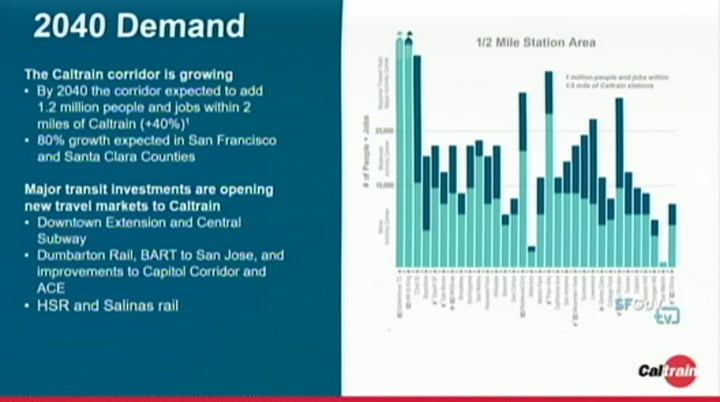 there's a huge amount of land use change in the bay area and in particular in the caltrain corridor. the graph on the right shows what's coming. these are the projections in our corridor. 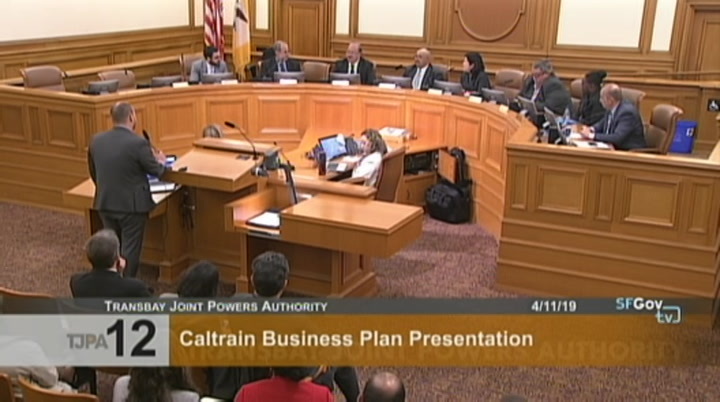 we're looking at sort of of 40% increase in human density around our stations by 2040. we know there are lot of those folks who want to raid rail. 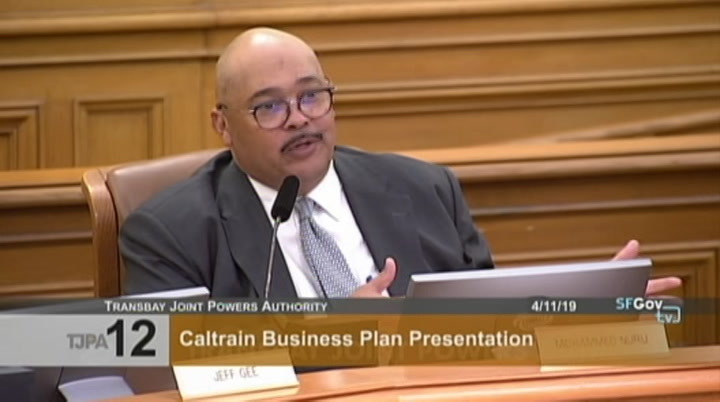 we're going to be much more connected system here in san francisco with the downtown extension with bart and san jose, connections through the state of california. 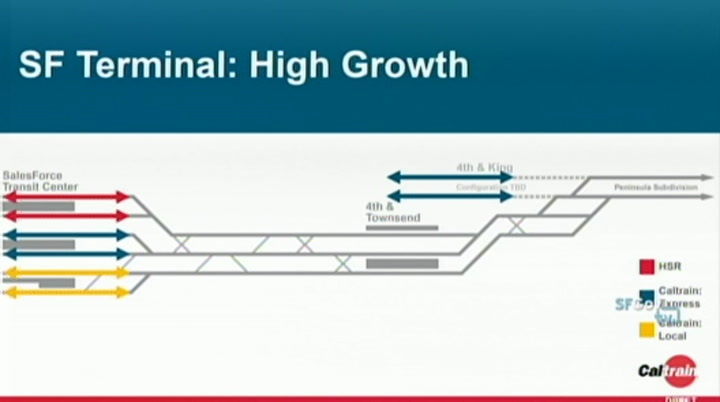 we're looking at a much denser and connected corridor. we did little bit of unconstrained modeling. if we had bartlike service, how many people might want to ride it? the answer appears to be a lot. going down to gilroy in the south. 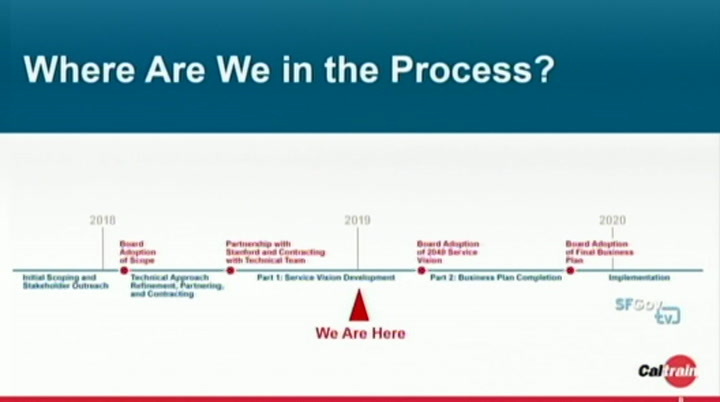 the baseline is really lot of the service and schedules we've been working with for the last five or more years. 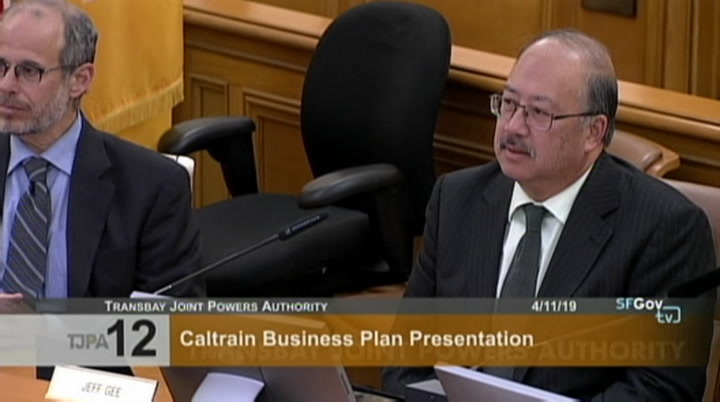 it reflects full electrification of caltrain and high speed rail program. not whole lot more than that. 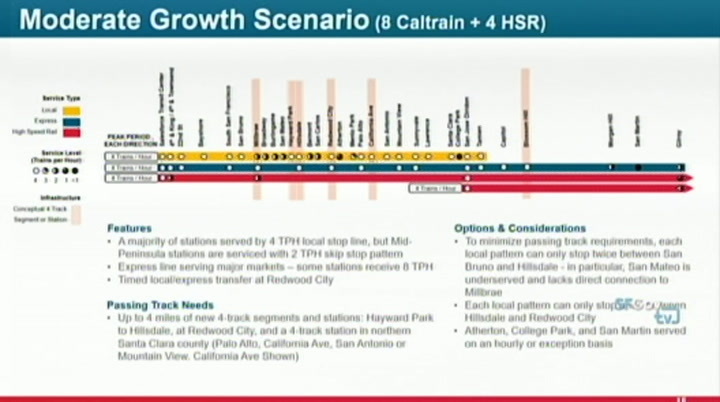 we've also developed a moderate growth scenario that looks at what if caltrain added couple of more trains. we got up to 12 trains per hour in the corridor. 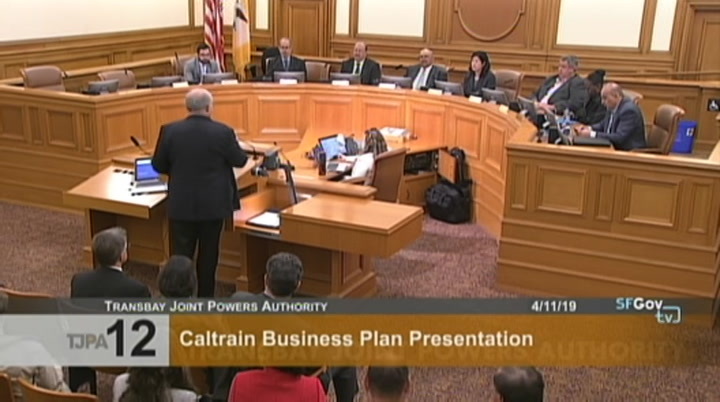 we have caltrain looking at 15 minute express pattern and local pattern. we tried to push the envelope look at how much service we can fit on the corridor. we went to 16 trains per hour. this pretty much maxes out the existing corridor. there's not really much more we can fit on it. continue probably for some tame. 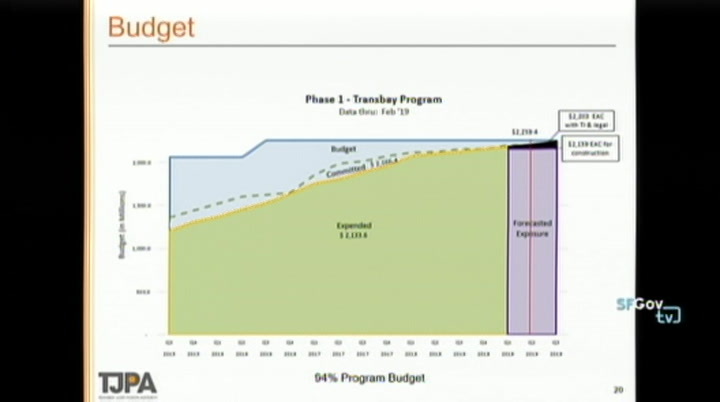 lastly, i wanted to highlight that we have done demand projections now we use the model to model corridor. that's when we found works best. 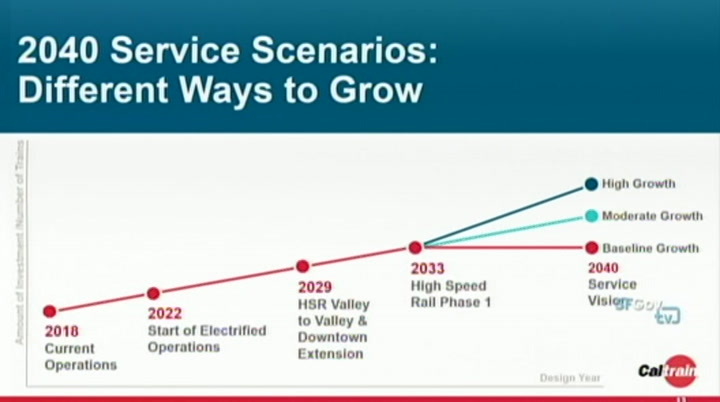 we have projected demand on all of these scenarios. 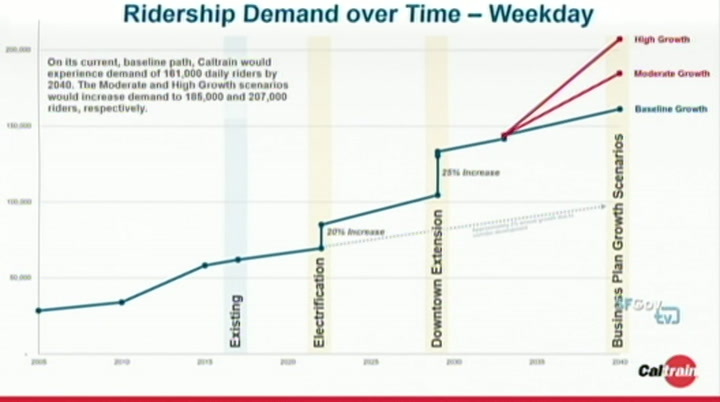 this graph just shows weekday demand for caltrain ridership. 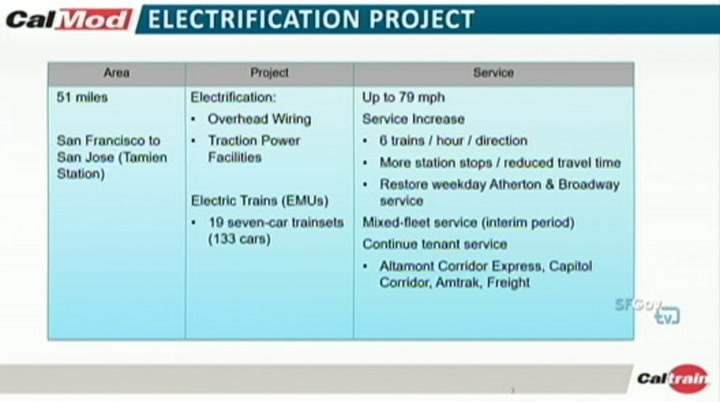 it was around 60,000 today, updated figures for electrification in 2022, we're looking at about an 20% increase. when we go to the downtown extension, we see 25% increase as we our system gets access to the core of economic activity and jobs. from there, depending on the different scenario, we're growing 161,000 at the base layne up to about 210,000.
dollars. that's what we model. 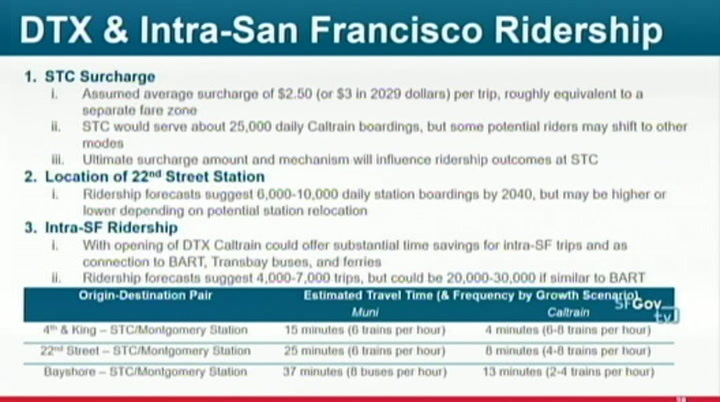 it does depress the ridership slightly. 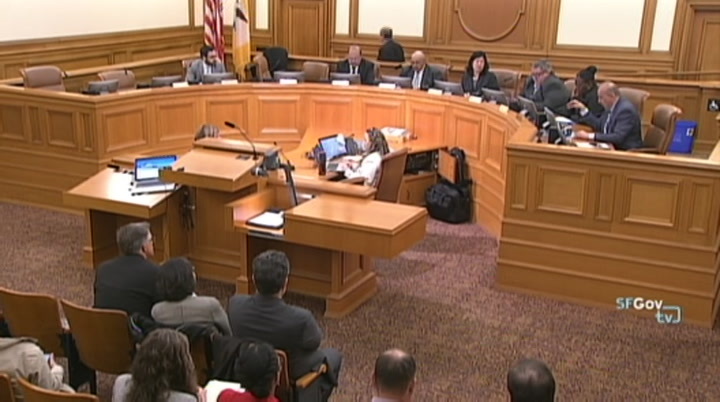 generally, we also think there's some other changes in san francisco that can affect raidership. one thing i say, sort of unknown for us is exactly how people may use the d.t.x. within san francisco. 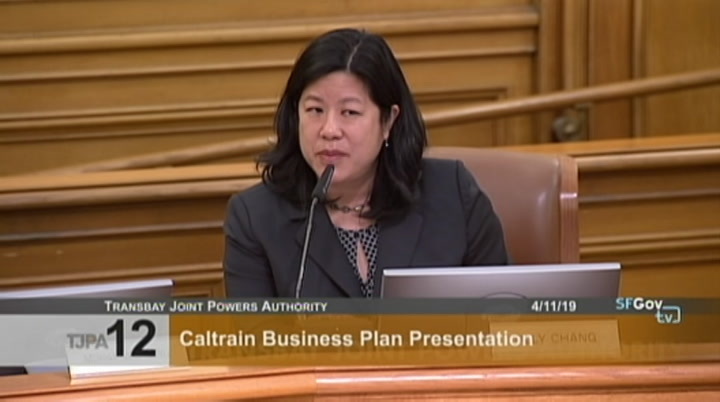 our ridership projections largely capture people as they use caltrain today. 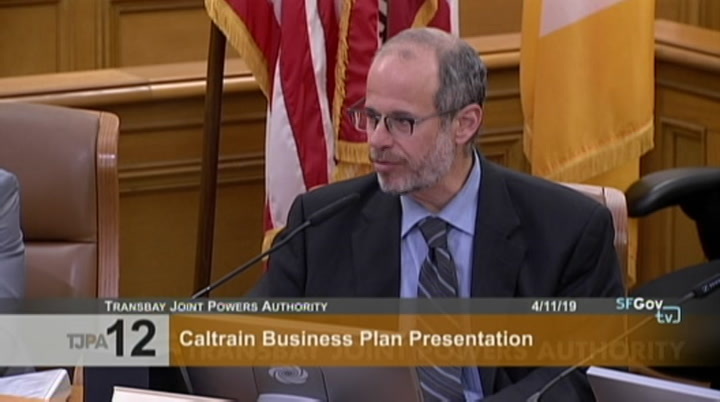 one thing we know with bart in san francisco, there are san franciscans who may use it like a subway to get to one part of the city to at. 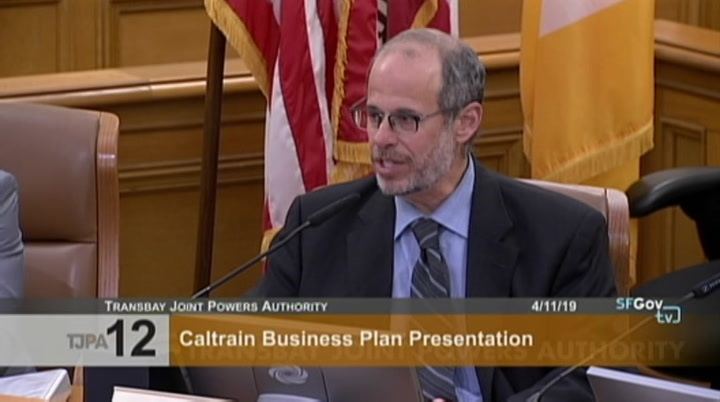 that type of ridership isn't probustlprobust -- probustly can our projections. 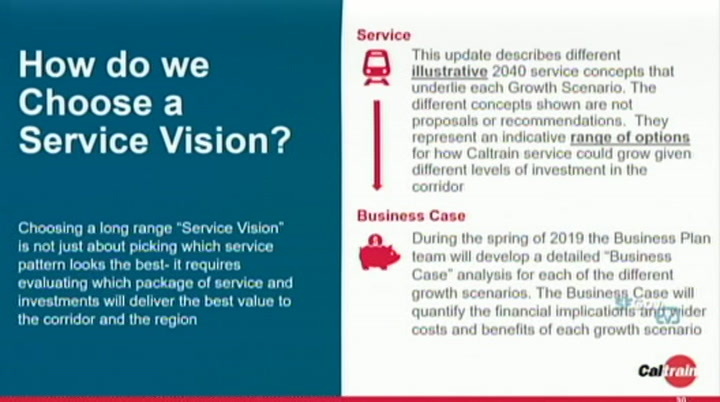 lastly, just to emphasize that we are moving towards a decision point by our board in the summer where they'll be asked to selects one of those growth scenarios a long range vision for caltrain to build towards. that's a decision that won't just be made on what the service looks like. we have raidership estimates. we want to provide a complete picture to the board so they can make a fully informed decision. the business plan, we have a website for folks who are interested this project. 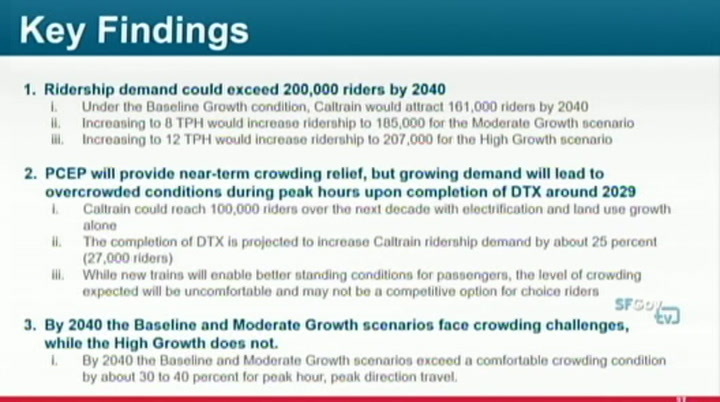 it's caltrain2040.org. it's a great resource for people who want to follow this process. just to emphasize, we have been doing lot of outreaches as part of this process. outreach with stakeholders and pier agencies. panel over the weekend and made some transitional comments saying, the city are wanting more services but they want it on their terms. they want someone else to pay for it. that doesn't work when we're talking about a region. we have to work to this together. there's a follow-up question to that. >> the issue what happens on corridor is a huge one. on the corridor that cal drain owns, there are 42 crossings. 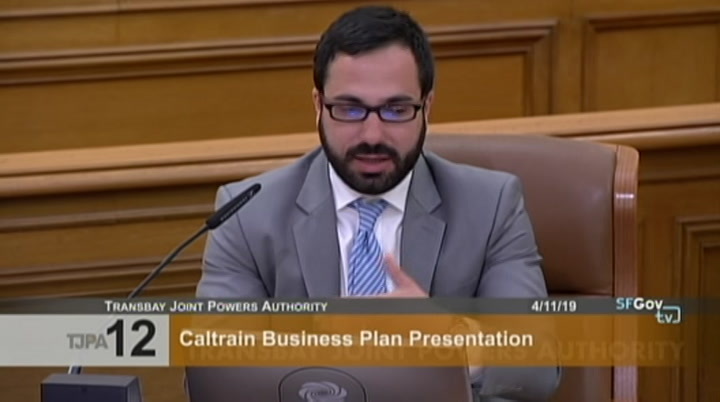 few look down it gilroy, there's another 30. we're in the process of putting together all the capital costs of investments that will be required to support any these service visions and the cost of addressing separations. that is the biggest item. san francisco has, i think, only couple of accurate crossings. 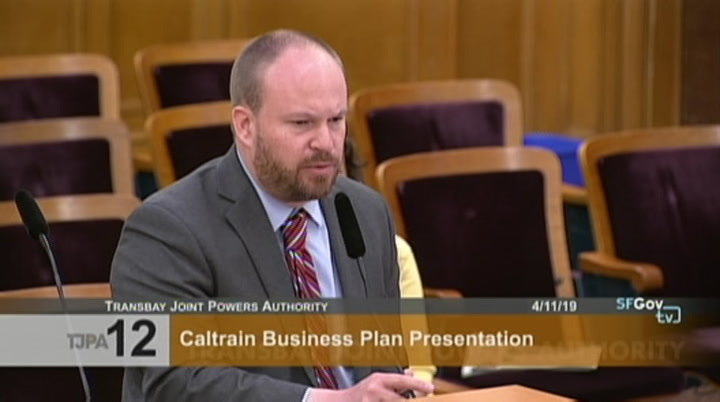 what we'll be able to do in the business plan is frame the need and talk about that in relation to the kinds of benefits that this service can provide. i think previously on the caltrain corridor, lot of the conversations around crossing have beency by city. they've been framed very rightly and importantly as traffic and safety. they haven't been trained as projects that maybe unlock a transformative level of service. 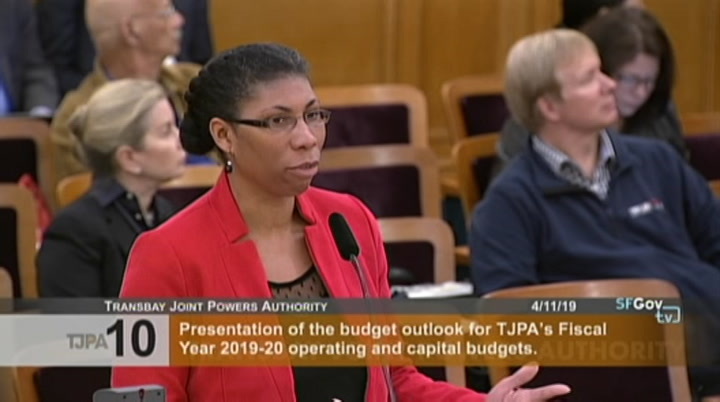 one of the things we're trying to do in this plan and coming out of the plan will be to frame the need and talk about maybe the strategic approach looking at this is a corridor-wide issue. 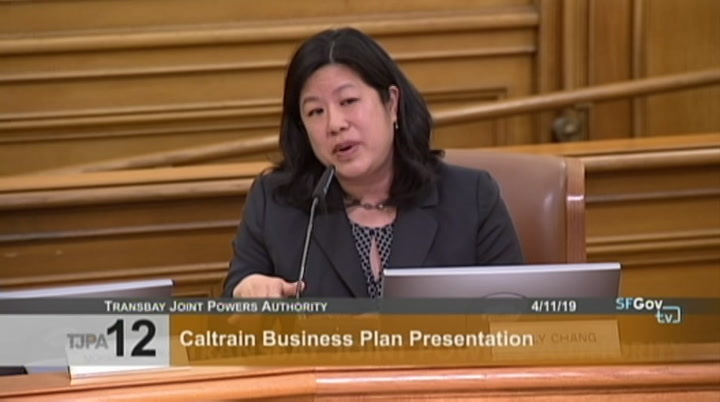 how we can works a corridor to find funding and find ways to make these projects cheaper. to be worked out. it's a good question director gee. we want to make assure i -- sure it works for passengers. finally on the question kind of a specific question to the demand projection. did you look at regional buses perhaps on express lane or any kind of scenario for the overall corridor for caltrain. 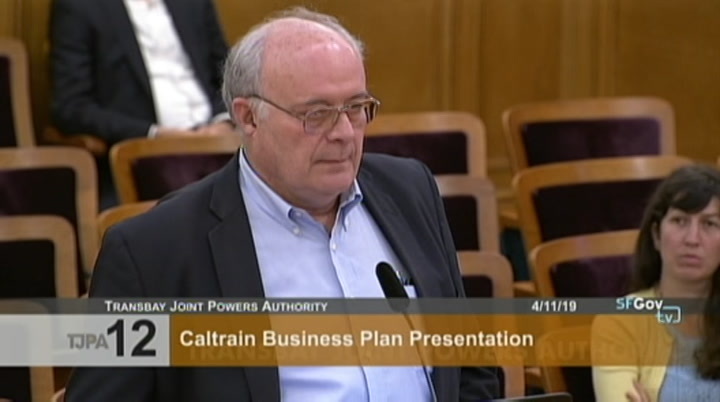 not just looking at caltrain by itself? 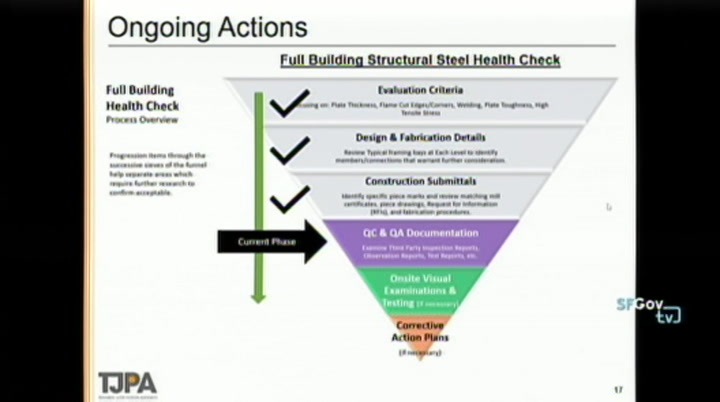 >> i did assume some level of services and projects in place. i will get the details. and upgrades coming in overtime. 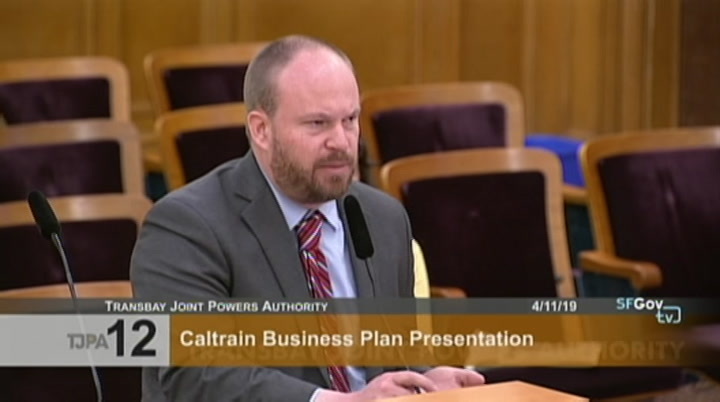 it's an exciting process that you laid out for the region and certainly we're very supportive of continuing to work with caltrain how the entire system works. thank you. >> thank you very much. i think you would say, we are growing. the numbers are high. the high scenario probably where we need to look at. thank you. >> you have two members of the public. we have mr. patrick and mr. lebron. >> jim patrick from patrick and company. i like to go back to my shoe. you remember the shoe. we shot ourselves in the foot. that clearly clarifies the bond act that determine it's a transbay and not fourth and king. having said that, the same ruling says as long as they don't use bonds, they can build whatever you want to build. going back to this. interest. you got to attract for 12 trains. only way you can achieve that is to start think being what you're doing with the d.t.x. and your approach on second street. right now, it's burning half the transbay box. it's a problem. 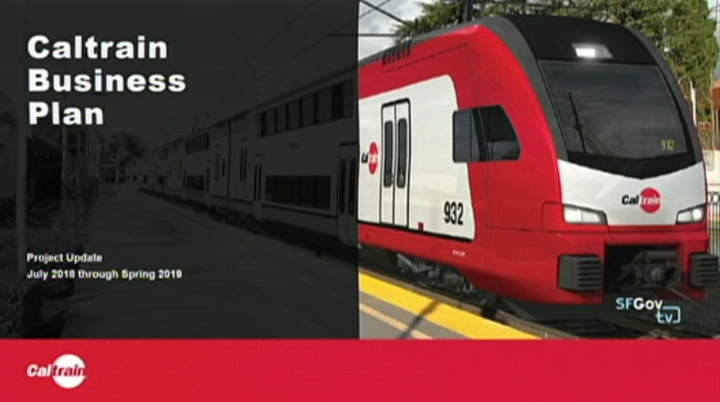 solution, you definitely have an opportunity if it's proper design, to turn trains around in brisbane. then you can have a full bus bridge to make the connection to downtown. 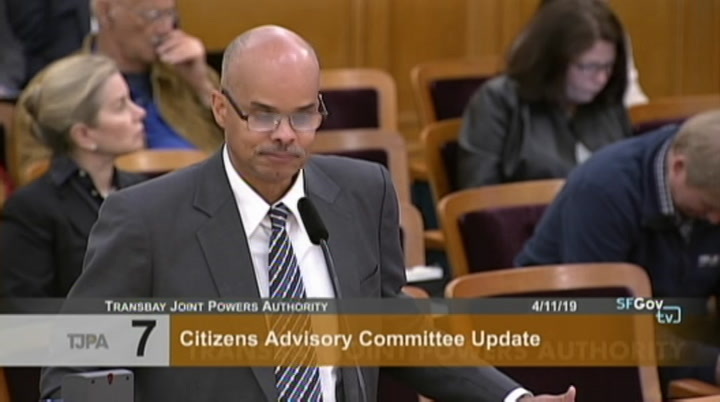 i testified and asked for resignation that this is not possible. 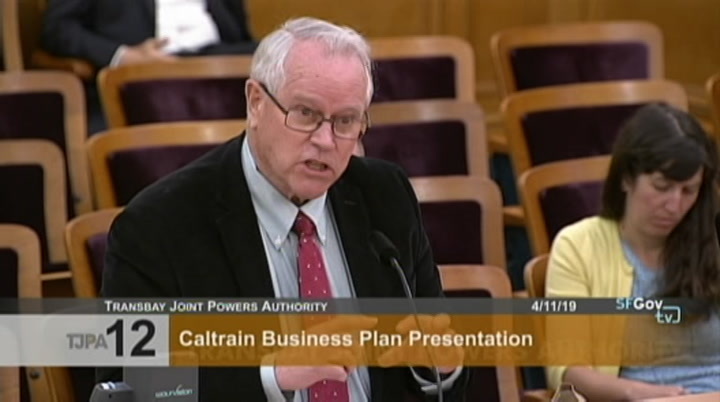 it's a high speed rail design. 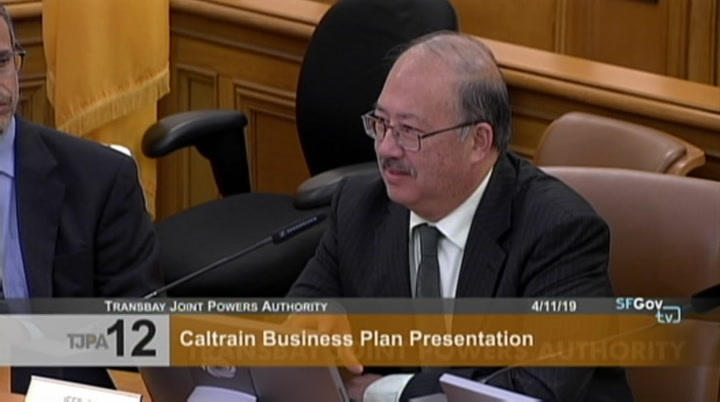 nothing to do with caltrain. >> that concludes your agenda for today. 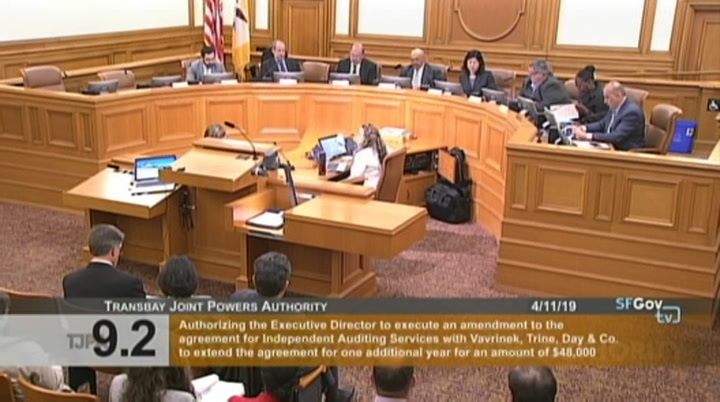 >> chair nuru: we are adjourned. >> thank you.